Browser versions in the recordings list are now a bit more accurate. Ohh and we've added the OS version as well! 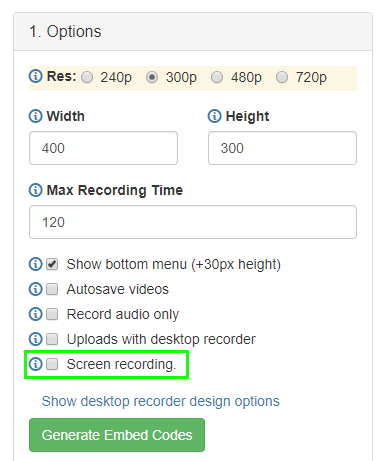 screen recording now works in both Chrome 72+ and Firefox 66+. Once enabled, the Record Screen button will show and you can start capturing the screen right away. Check out the blog post for detailed info. We've just launched a new Logs section that gives you access to all the successful and failed attempts to access the camera and microphone with getUserMedia(). This section is a very useful tool to help you give better customer support, get accurate analytics and look up user attempts to grant access to their camera and microphone. You can find out more details in the blog post. you can filter and show only Recovered recordings (recordings for which the connection was interrupted mid-recording and auto save was ON). We've implemented a catch all mechanism for all of the situations that were producing 0 byte recordings coming from the HTML5 desktop recorder. Previously, when a 0 byte file was made, the user that made the recording had no idea. For the first 2 seconds the message Waiting for data... is shown and the recording counter does not start, because nothing is actual recording. After 2 seconds if there is still no incoming data, the message Device error: no audio or video data is shown and the UI is reset, so that you can retry to record. The failed recording is not saved. The messages that we were showing when our HTML5 desktop recorder was requesting camera and microphone access needed an improvement. We've updated the messages to be in line with the text used by the browsers. Words like access and webcam were replaced by the keywords use and camera respectively. When requesting access, we've added the domain name of the website in which Pipe is embeded in, for a better understanding of the context. In case the user blocks the camera and/or microphone, an additional message is shown which informs the user how to unblock the devices. Now when you record audio only, the messages refer just to the microphone device, in order to avoid any kind of confusion. Fixed issue with the YouTube integration no longer uploading videos. 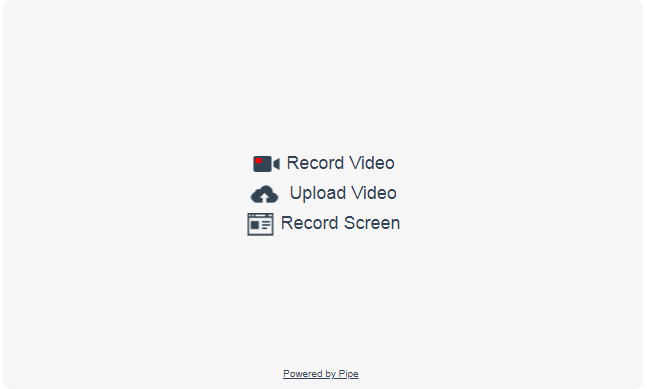 We've just rolled out the new HTML5 desktop-like inline recorder to all Pipe accounts. It can be activated from the environment settings. It will work on Chrome 63+ on Android on secure origins (https). More details in the blog post. A new configuration option in the S3 bucket configuration page allows you to specify custom S3 endpoints. Fixed issue with videos from mobile not being rotated according to their rotation metadata. This affected videos with H.264 video and AAC audio as on such videos we did minimal processing. For some time now we've been working closely with a pen tester to tighten the security of the Pipe platform. Surely Pipe will start publishing changelogs very soon.